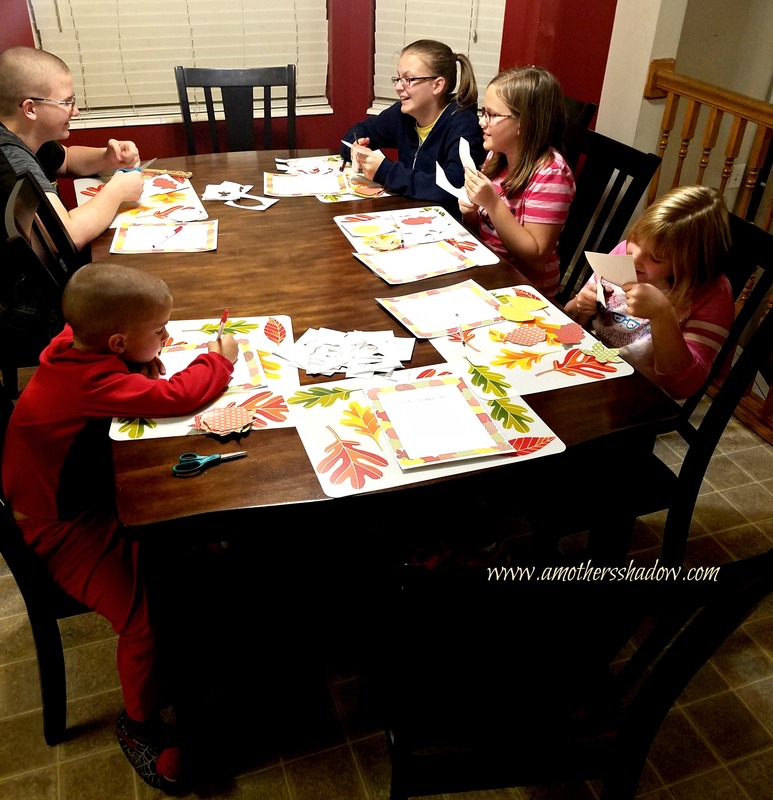 Help Your Family LIKE Each Other! 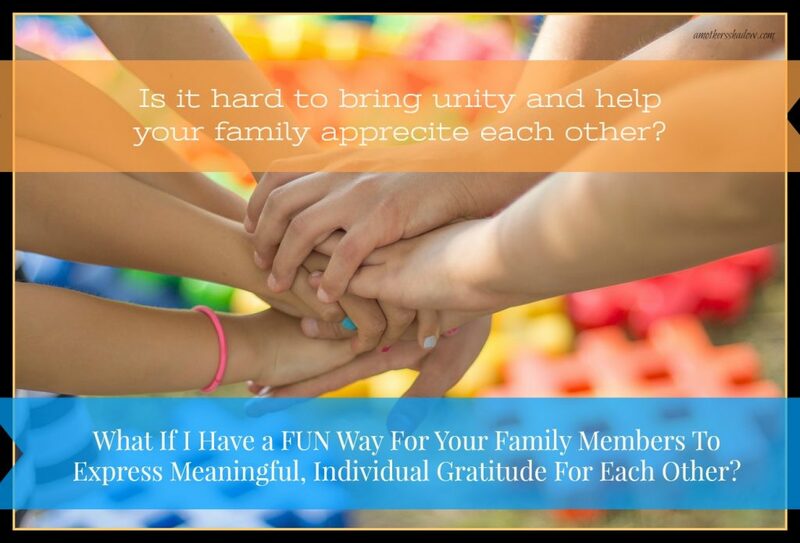 Help your family like each other, or actually acknowledge they like each other with this easy and fabulous activity! Families are the most important group or unit there is. BUT getting each one to express, or say nice things to the others, often turns into silliness, or other off-topics because of awkwardness. However, it is critical and the foundation of the home that every person knows that each one in the family does love and values them. This activity provides that opportunity in a fun and natural way. You can have a treat, such as small candy and after each leaf is filled out with meaningful content, the candy is awarded. Hey, you gotta do what you gotta do sometimes with certain personalities to help them overcome their shyness/embarrassment of showing emotion/etc. Teaching sincere kindness and service to another person is more valuable than any treasure on earth and it begins at home. This is service in the highest form, letting those closes know how you sincerely feel in GOOD and positive ways. This attribute of recognizing the best in others and finding their strengths, is an investment of time and energy on your part. Yet it will be a skill your family members will use to become better, which will benefit them for the rest of their life. 1- The first part of the activity, each person writes down what they are thankful for. 2- The second part in a fun way, helps bring attention to every member of your family. It identifies how each person is a unique and special blessing to the other individuals and to the family. Sometimes in our family, life gets so hectic and crazy that it is easy to forget to let each other know how much we much value them. Siblings don’t often know how to tell each other what they like and appreciate about the other(s). This is a very simple and wonderful activity that can hang up in your home as a reminder, or in the family member’s room, and bring constructive results you might have never expected or had otherwise. 1- Explain to your family that fall, or November in the United States as we celebrate Thanksgiving, so it’s natural time to express gratitude. In many in other parts of the world it is also a time to celebrate Thankfulness and Gratitude. 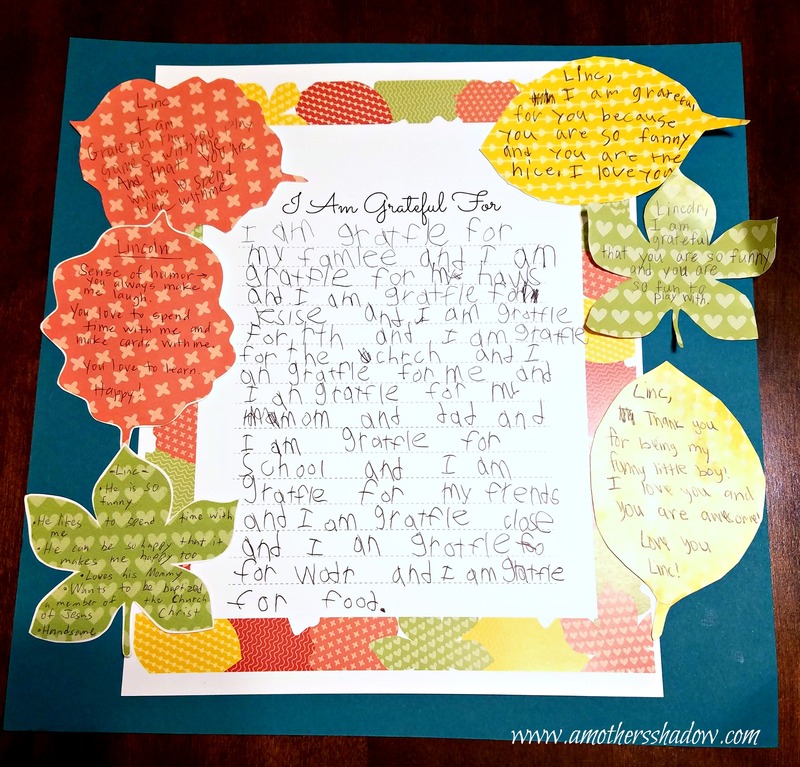 2- Everyone is given the ‘I am Grateful For’ paper that has a leaf border with lines to write on. 3- Then ask your family to write whatever they are thankful for and grateful for in their life (ok…have them keep it off the ‘too silly’ radar, bribery aka rewards with a treat at the end really helps). I would begin brainstorming together so it is thoughtful and they dig a little deeper than things like: I am thankful for my phone, Wii, etc. Get them to think of the ‘real’ stuff in life. You might want to begin with things you are thankful for: sunrises and sunsets that I am able to see with my eyes, the breeze on my face because that means I have a body, knowing there is a God and He loves me. 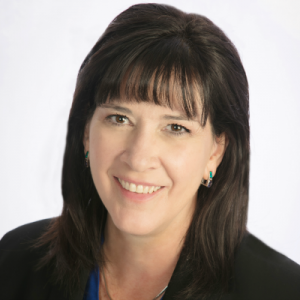 You can help get the conversation going as you dig deep yourself and learn new things about your family. 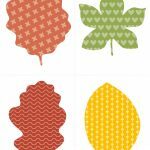 4- Now, you can pre-cut out the leaves if your children are young, or have them cut them out if they are old enough during this activity all depending on the ages of your family members. If you are going to be short on time, you might want to pre-cut them yourself and have them ready. Have enough leaves for every person to be able to write on ONE leaf to each person in the family. For example: I would write on a leaf to my handsome hubby Stan, and when my kids were all home, that would be five, so I would need six leaves for me, six for Stan and six for each of my five kids = a total of 42 leaves. There are 4 leaves on a page, so I would print out 11 pages, leaving a few extra for just in case we needed them. 5- Now for the next extraordinary and eye-opening experience of this very worthwhile time together as a family. Have one person be the focus, or spotlight at a time. IMPORTANT STEP! For the model here, let’s say we are focusing on Stan. He would be a bit embarrassed as the rest of us choose any leaf we wanted, pick a sharpie using a color that will stand out on the leaf, and wrote to dad/hubby/grandpa/uncle/friend (see how many uses this has!) an example of what we are thankful about for him. We want to encourage specifics so that it’s not: he’s a great dad, he’s nice, etc. If your children are too young, or there are other circumstances requiring assistance, write for them. This is where I love using the clip boards to put the leaf on to write to hold it and not risk any bleeding through onto my table, a book underneath or even denting my table by pushing with a pen. IMPORTANT!!! Stop anything that might even start an argument or quarrel. Do NOT let sarcasm or the slightest bit of criticism be in this activity AT ALL!!!! Pass the leaf to that person and then onto the next person, until everyone has been ‘spotlighted’ with a leaf. Since the leaves are not large it isn’t intimidating to write something kind, nice and SINCERE. 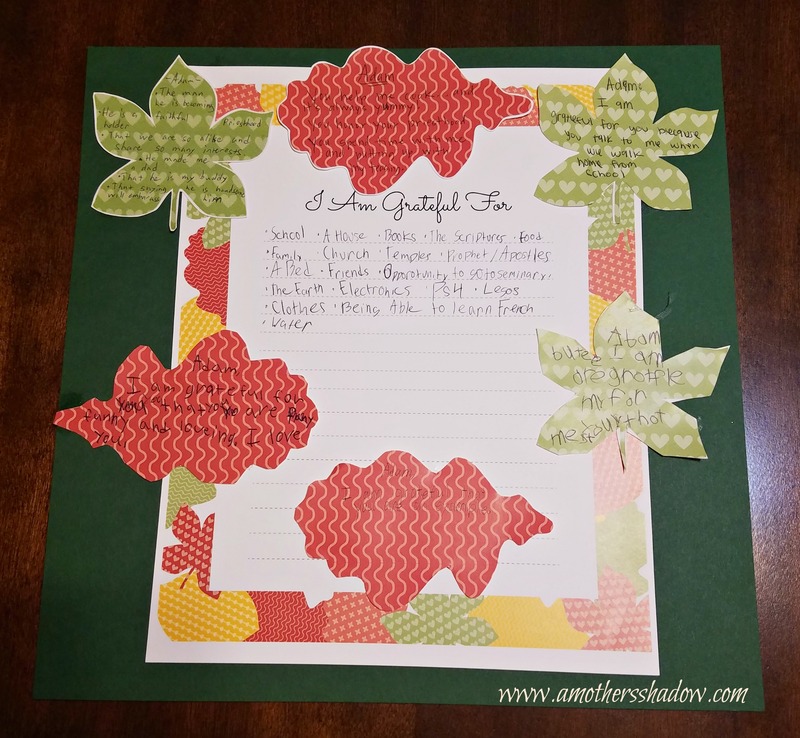 *****You can write on the leaves once, or do this as a weekly activity during the month and keep adding leaves on the paper, or attach to a ribbon, on the closet door, the options are endless! 6- When all the leaves have been written on, now it’s time to assemble. Have the glue dots or glue sticks ready. 7- The fun really begins as each person attaches the leaves around THEIR paper with the leaves that the OTHERS have written on! You can see the examples here. I want to give a HUGE thank you to the Woll family for doing this tutorial, and allowing us to share their experience with us. You can see for yourself what a fabulous family they are! I am so GRATEFUL for their friendship!!! You might also enjoy my Family Time-Family Home Evening (FHE) series as well as many other topics!